The DEA isn't going to let this one go. Thousands of dollars in drug money went flying out the window as a couple of suspects tried to ditch it during a chase. 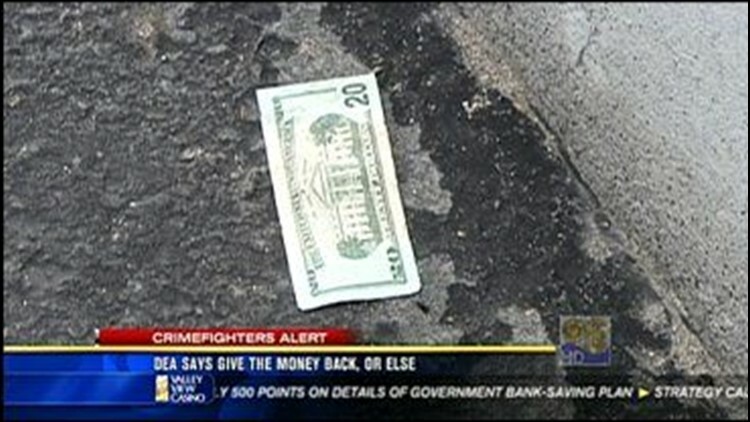 Now authorities want the cash back from the San Diegans who picked it up. Sorry San Diegans, this was not part of any economic stimulus plan. The only thing it's jumpstarting is an investigation by the DEA. The DEA tells News 8 they'll review police video, news footage and pictures and video clips they've received from people who captured the faces and license plate numbers of drivers who stopped on the highway, risking their lives for some quick cash. The DEA says it's going to make contact with these people, and is also talking to the district attorney's office and the U.S. Attorney's office about options it may have to press charges. "They're guilty of potentially a number of offenses from money laundering to obstruction of justice, to removing money subject to seizure," criminal defense attorney Michael Pancer said. Pancer says don't risk it. "You might as well turn the money in. It's just not worth even the slight potential you might be criminally charged," he said. For one man, stopping to pick up cash has already gotten him in trouble at work, as he predicted. He's the driver of an MTS access bus, which services disabled passengers. His employer, First Transit, tells News 8 he has been interviewed and reports he turned in the money to a police officer on the scene, but has been put on administrative leave while they investigate. The bus he was driving was empty. As for the missing money, the DEA won't say how much is missing, but says you still have time to return the cash to the DEA or San Diego police with no ramifications - just do it now.